Google's Native Client (NaCl) has already made it possible to play new console style rich 3D games in Linux. Games like Bastion and Pocket Legends now run as fast as native games making full use of 3D graphics hardware through WebGL. 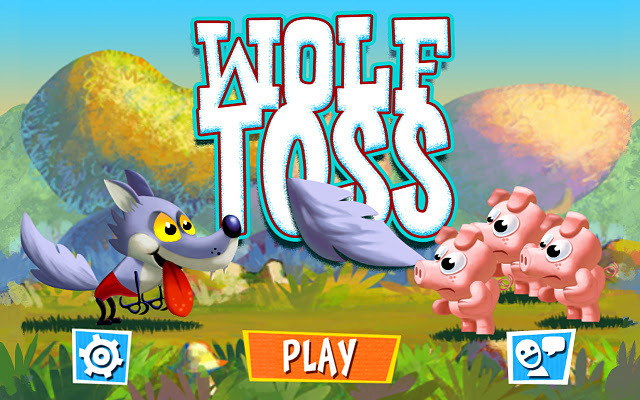 In Wolf Toss you have to guide the Big Bad Wolf in his battle against the Three Little Pigs. You can shoot from cannons, explore huge levels and circumvent towering defenses that go way beyond hay, sticks and bricks or use strategy and power-ups to burn, roll, float, blast and even teleport your way past rubber walls, moving platforms and spinning propellers to delicious victory. If you get stuck, try your luck on the Cheat Wheel to gain a really unfair advantage. The game features 144 levels across 3 worlds and 3 difficulty settings. Check out the video below. Each night Jack dreams of his favorite toys: laser-blasting Galaxianoids, gun powder-packed desert dwellers, electricity zapping creatures of the Deep Deep Sea and Crazy Bosses. You have to help Sleepy Jack fly, dodge, collect, shoot, and bomb his way through 40 dazzling dream worlds in this console-quality 3D flying game. Your kids will love this game. Cordy is a little robot with a big job - to power up his world. Help Cordy run, jump, push, pull, lift, throw, bounce, swing, and hover in this beautiful console-quality 3D puzzle platform game. If you have trouble getting native client to work in Linux, read our How-To from here.